The power requirement for your well water pump depends upon the depth of the well and its output. There are several types of pumps --- some designed for deep wells and others for shallow wells --- the two most common being a jet pump and a submersible pump. They are usually between 1/2 horsepower and 3 horsepower. It is usually not a good idea to install a pump that is too powerful for your well and puts out more water than your well can produce because it could "draw down" or lower the level of standing water in your well and your well might run dry. It is not difficult to determine the required horse power of a well pump. The output of a well varies according to its location and geographical conditions. 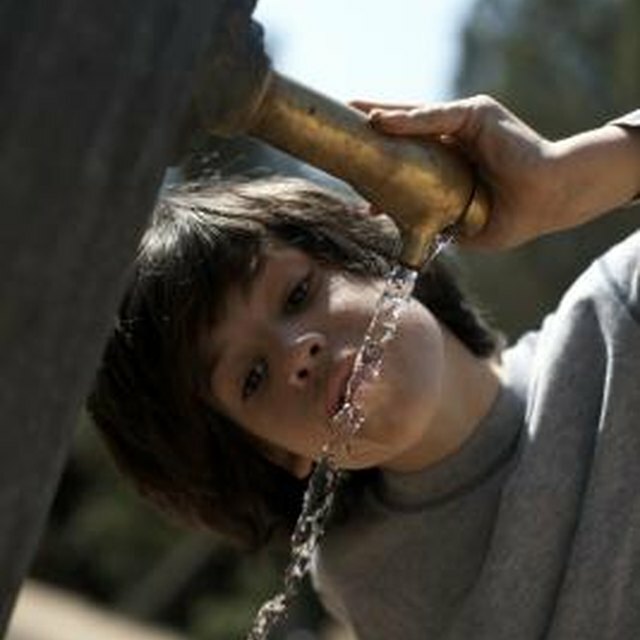 In areas where the water is scarce and hard to find, your well may only be capable of producing 3 gallons per minute, while in other areas artesian wells that produce more than 100 gallons per minute are common. The first step in determining your pump's horsepower requirement is to have the well tested by a qualified contractor so you know its maximum output. If yours is one of those wells with unlimited supply, you should determine how much water you will likely be using at peak times. The easiest way to figure this is to count the number of water fixtures in your house. Consider each bathroom to have three fixtures, then add kitchen sink, dishwasher, clothes washer, laundry sink and two outside yard faucets. Assuming one bathroom, this would add up to nine. You would most likely need a pump that produces about 9 gallons per minute. If your well cannot produce 9 gallons per minute, you may have to add a water storage tank. It is important in determining the necessary horsepower of a well pump to factor in a pressure tank. Set to the correct pressure, this will ensure that the water is transported to the home at a pressure high enough to run the appliances. Most household appliances need a pressure of 10 lbs. per square inch and lawn sprinklers need a minimum of 20 lbs. per square inch. It is best to assume that the pressure tank will be set at between 30 and 50 psi or 40 and 60 psi if the pipes are old and have deposits of minerals inside them reducing their diameter. Give all this information to a pump dealer, who can recommend the best pump with the most horsepower to fit your specific needs. A low-producing well would probably only need a 1/2 horsepower pump, while the pump recommended for the 9 gallons per minute discussed above would be 3/4 horsepower to 1 1/2 horsepower, depending on the depth of the well. The further the pump has to pump the water --- or the deeper the well --- the more power it needs. A pump used for irrigating crops with a high producing well would need to be stronger, 3 horsepower or more, because it has to put out a far greater volume of water per minute than a domestic well. There are well pumps that run off 110-volt and 220-volt power, and solar-powered pumps are becoming more popular.